Roswell has cancer and we don't know how much time she has left. It may be weeks, or it may be months but we do know that every day from now now until the end is going to be the happiest day of her life, and you're invited to share it with her. This is Roswell's last party. And it's the best party. Roswell's Last Party doesn't have a specific date, it lasts from right now until her last moment on Earth. She'd love it if you came by to visit, rub her belly, feed her nori, let her sit in your lap, pet her head or just hang out. Don't be sad. While this is the end, it's the best life a cat could have. Let me tell you a happy story. Let me tell you a happy story about a kitten who was never supposed to have anything but who ended up having it all. 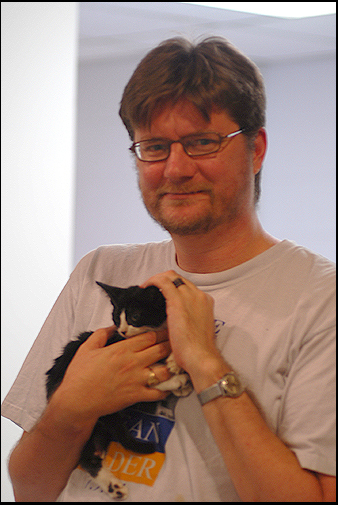 Roswell came to us in 2006 when Phil Forrest texted to say that there was a stray kitten on the back porch. She was skittish and he wasn't able to catch her. 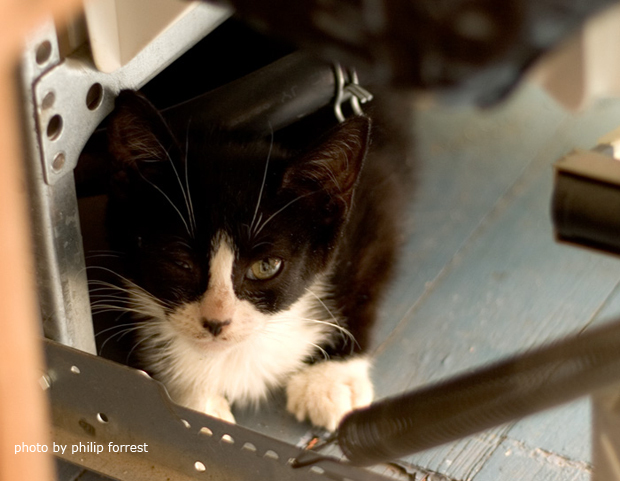 Over the next couple of days, she got a terrible eye infection and was a blind kitten running around in the back yard. It was easy to catch her then. Phil and Stacey and I caught her. She was feral, she hated people. So twice a day, we would chase her into a corner and throw a towel over her and then pet her for 30 minutes. She wasn't very happy about it, but we gave her as much love as we could. Eventually, she realized that she liked getting her belly rubbed and that people were ok. And we started to try and find a permanent home for her. She had a cute sister named n00ton who she loved as much as she loved belly rubs. She was a filth thing. Then one day while we were playing, Roswell had a seizure. It was terrible. She thrashed around like a fish on a spear. She howled and screamed and I ran out into the street with her and jumped in a taxi and they raced us to the veterinary hospital. When I got in the door someone looked at her and yelled "triage for a cat!" They took her away and I wasn't sure if I'd ever see her again. She looked terrible. 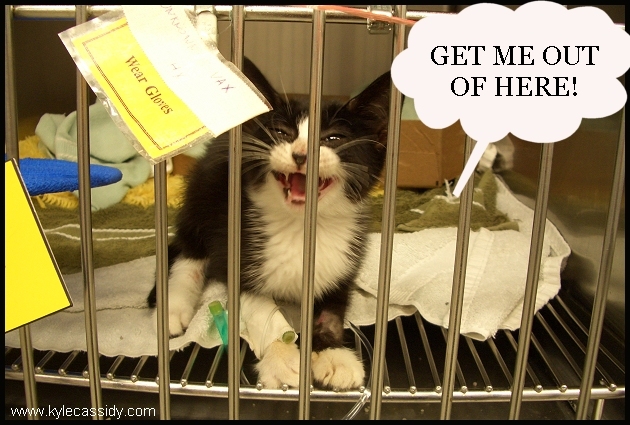 After a few hours a doctor came out to see me and he said "This cat has meningitis, an infection of the brain. It's very bad. It may die soon." And I asked "what can you do?" And the doctor said "we can try treating her with antibiotics, but there's no assurance that will work. And it will be expensive." And I said "well, what should I do?" And the doctor said "I can't give you advice, only information." And I pressed, "What would you do if it was your cat?" Up until this point I'd never thought that Roswell was my cat, only that I was holding on to her until we could find her a person. "Well," the doctor said, "if it were my cat, I'd try the antibiotics, but I get a discount, so I can't tell you what to do." So I said, "let's try the antibiotics." And the next day they called me and they said "Your cat may die today." And the next day they called me and they said "Your cat may die today"
And the next day they called me and they said "Your cat is 100% better, you can come and get her." And so I posted about it to the Internet and went to spring her from Intensive Care. How joyful! I went in to pick her up that afternoon. I knew it was going to be expensive, which was frightful, five days in the ICU? When I got there, I asked "how much is it?" and they said "her bill has been paid, people have been calling in all day and contributing money for her." You can just take her home. We were very happy and we promised then to pay back what people had given her to other people who needed emergency help with vet bills, and we've been doing that ever since and we're going to keep doing it. 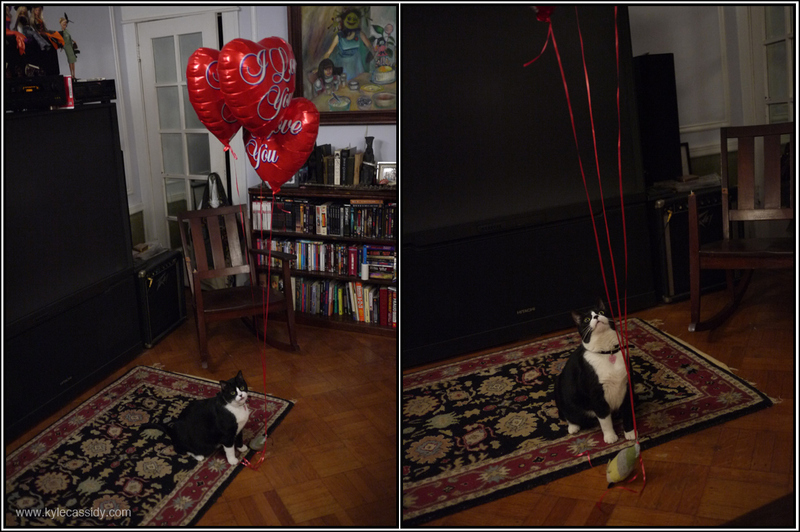 When we got home, there were dozens of cards that people from the Internet had sent Roswell. I read every one of them to her, and she played with each and every card. After that day, Roswell followed me around like a puppy. She'd just been a cat before then, but now she wasn't just a cat. She was a cat with a person and she'd chosen me. So I stopped looking for a home for her. We decided to learn to cook together. And she sampled everything and made suggestions. She was a fearsome hunter. Like Godzilla. 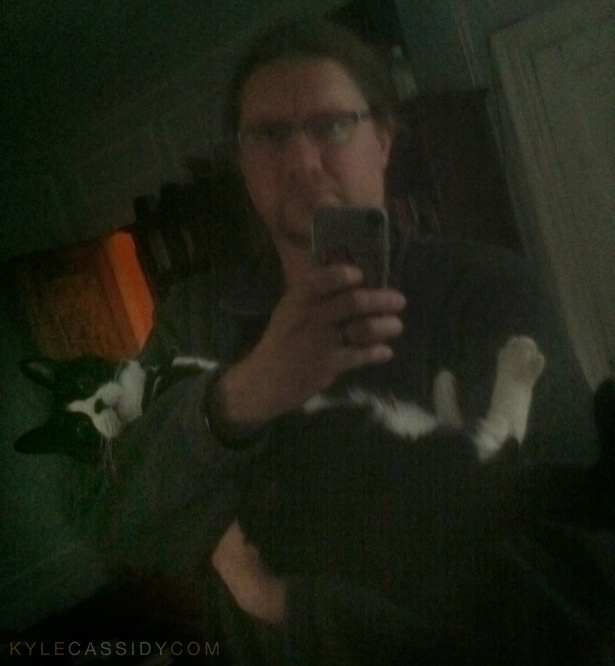 She decided that she needed to be carried around, like a baby, for at least 20 minutes every day. This was non negotiable. And it continues to this day. This is one of the things you can take part in at Roswell's Last Party. She was a powerful literary critic. Both a lover and a fighter. We also kept working on that cookbook. Somewhere along the line she got diabetes and became the poster girl for how cats do well with that disease. We got letters from vets saying they showed patients Roswell getting her shot to make them realize how manageable it was. She loves to eat seaweed. It's her favorite food. You can bring her some if you come over. She did a series with famous novelists where people could write fanfic about her in the world of a new book and get an autographed copy of the book. Seriously, that was a thing. People have done some wonderful fan art of Roswell. I love this one of her as Teddy Rosevelt. Throughout it all she's just been filled with love and forgiveness. She's been my best buddy and I'm happy to have spent the last twelve years with her. And however much time we have left. So come visit. Say hello. Say I love you. We don't need hugs, we don't need sad faces. 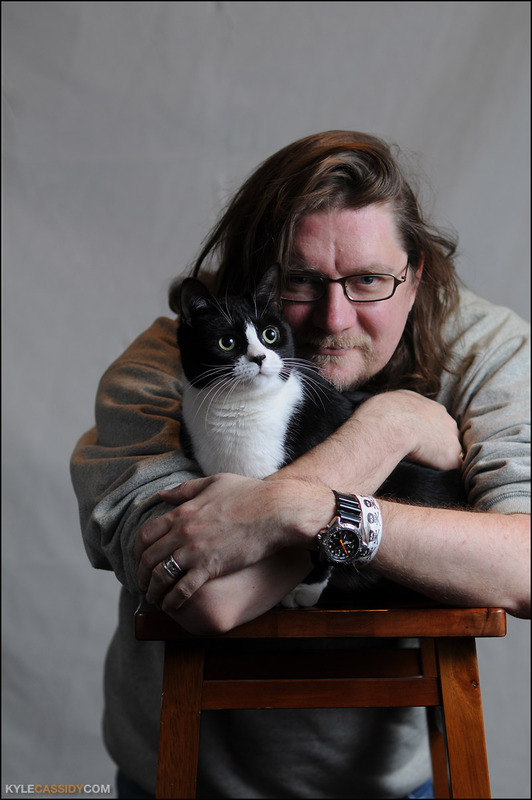 This is a happy story about a kitten who should have died under a bush a dozen years ago never knowing love but who has had more than a decade of the greatest life any cat could have. We just want you to share in our joy. She'd love if if you'd come by and make a fuss about her. We know she has a fan club from out of town, if you're thinking of coming to visit from far away, we can probably put you up. Let us know. 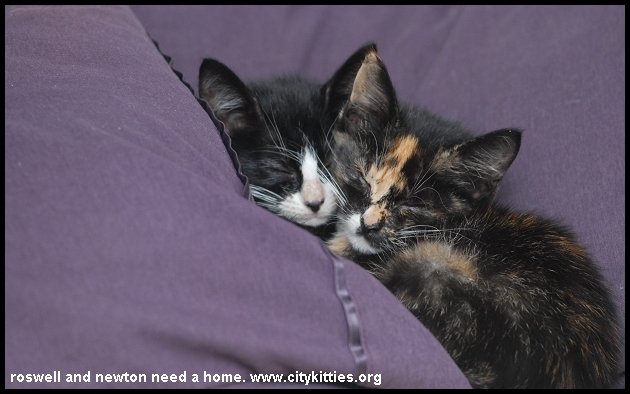 And if your want, donate to City Kitties, they're the ones who helped save her in the first place. 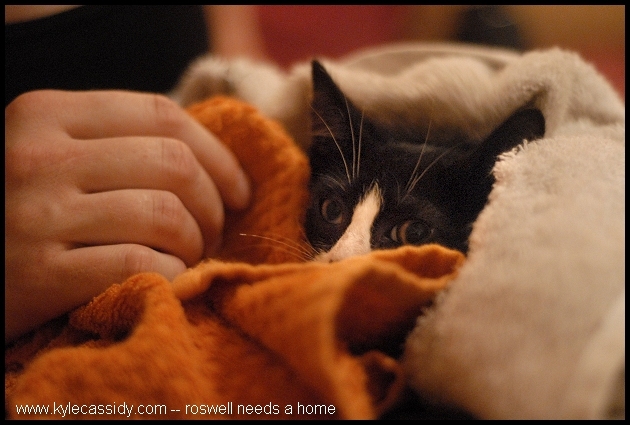 If you have favorite Roswell photos or memories, please post them in the comments. Tell Roswell to look for The Meezer on the other side of the rainbow bridge. And Roxanne and Zevo, too. Tatiana and Milla will be there to pester her. ...I just can't help it. This saddens me. 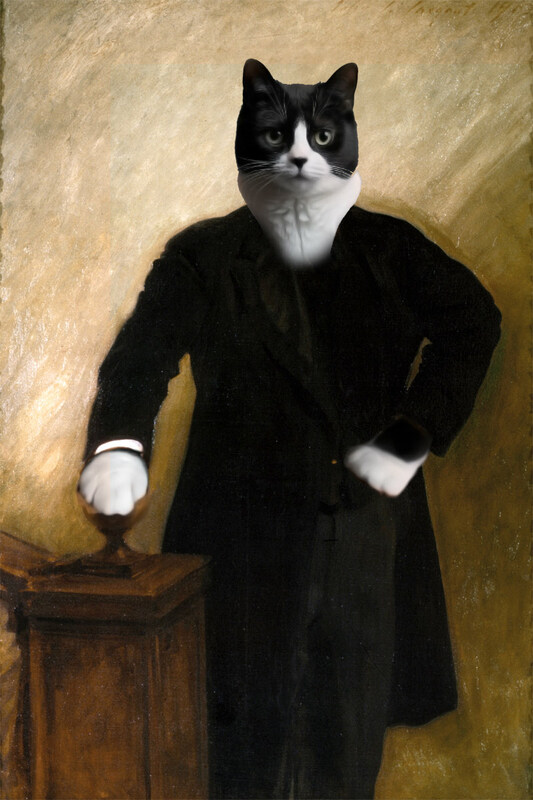 Tuxedo kitties hold a place of honor in my heart. My first cat Spitfire, then Calamity, then Lump...there's just something special about them. Roswell has such a kind face like Spitfire. So I am sad. But what an awesome life she has! I know Roswell knows love and she will carry that love into the afterlife, she'll wear it like a badge of honor. Always loved never forgotten. Roswell is the best cat. Always inspecting the camera gear to make sure it’s up to snuff, making sure you’re awake ala #morningcatface, making sure guests have been verified. It’s a lot of work. ☺️ I’m glad she’s had the best humans, (and her own fan base) a kitty could ask for. I've been following your journey with Roswell from the start and I am so happy that you found each other. Even though I can't be there in person to give her belly rubs, I am sending love and happiness to you both. Thank you for sharing Roswell with us. There's little doubt in my mind that Roswell is a key reason I've done so much vegan cooking and vegan eating for the last several years. When Carter racked up heavy vet bills last fall, people were incredibly generous to us, too, and like you, I've been doing my best to pay it forward ever since, and will keep doing so. 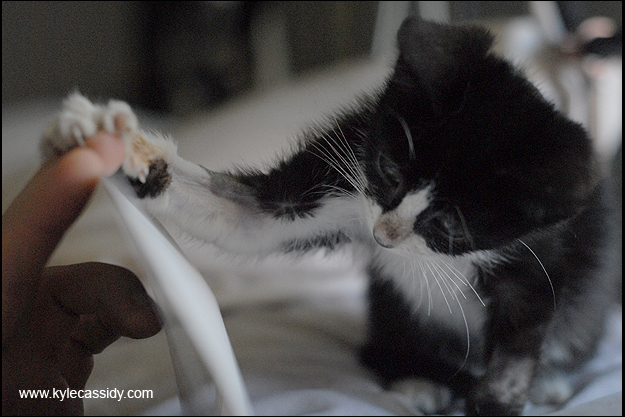 It's been a while since I've donated to City Kitties on Roswell's behalf, and it's about time I did so again. 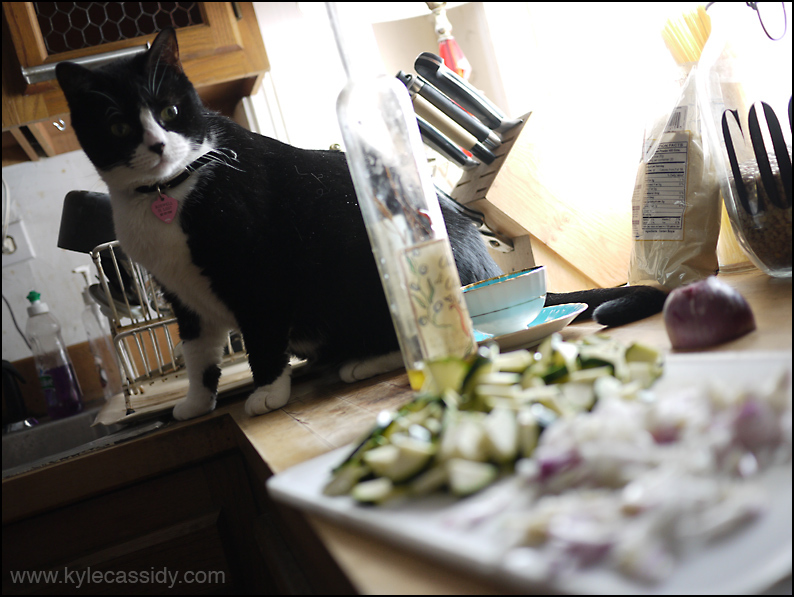 Thank you for sharing Roswell and her cooking (and other) adventures with us. I don't know if I'll have a chance to pay her a visit in person, but please scritch her sweet little nose for me. I commented on your FB post about this but wanted to leave a pebble here as well. <3 to Roswell and to all of you who love her. I wish I could come to her farewell but will have to do so in the virtual world. I made some Roswell fan art for you some time ago (Roswell as Maxwell Smart, Roswell on a sci-fi pulp novel cover) and am trying to find it for you. To be honest, Tatty was my favorite and Roswell could totally sense it. I remember holding Roswell and giving her a belly rub and Roswell was all, "this is nice, but I know you'd rather be skritching Tatty. Go, human, go to the cat you really love!" 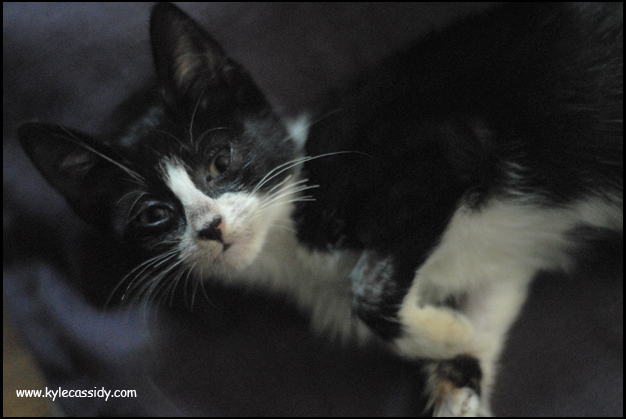 Roswell is adorable and your photography plus her personality created a celebrity that could never let us down. Strong-willed and floofy and interested. She brought us together (remember the stewardess bringing you First Class cookies on a plane, with a request to send her regards to Roswell?). My favorite derivative art is the steampunk Roswell in the dirigible. My favorite Roswell meme is the one where she's on her back haunches, grabbing and biting at something, and someone captioned it with a line from Carrie Underwood's "Before He Cheats." That diabetes vid never fails to crack me up. I can't comment anymore, I'm getting teary. (x-posted to your FB thread) [picture of a black tuxedo kitten- I forgot how to post images in LJ comments...] Roswell, meet Roswell. A special kitty came into my care as a foster today. She was born outside a few weeks before Hurricane Florence came through North Carolina, survived the storm, and a Nice Lady who takes care of a feral colony fed her and her littermates (with the goal of trapping them and adopting them out.) Last week, the Nice Lady (who happens to work with a vet) found Roswell on the side of a hiking trail, mostly dead from an infection. She brought her to the vet, thinking she would need to be euthanized, but Roswell pulled through! She's staying with me to continue to recover and become more socialized while the Nice Lady takes a vacation. If things work out, I will probably foster Roswell until she is ready for adoption, either through a rescue or independently. Either way, I hope it brings you and Trillian Stars (and OG Roswell!) some happiness to know that your example inspired me to become a cat foster mom. Roswell is my 5th kitten this year. In life I have tried to be a pessimist thereby avoiding the pain of disappointment, "always glad to be wrong that the worst did not happen" has been a trope for me. 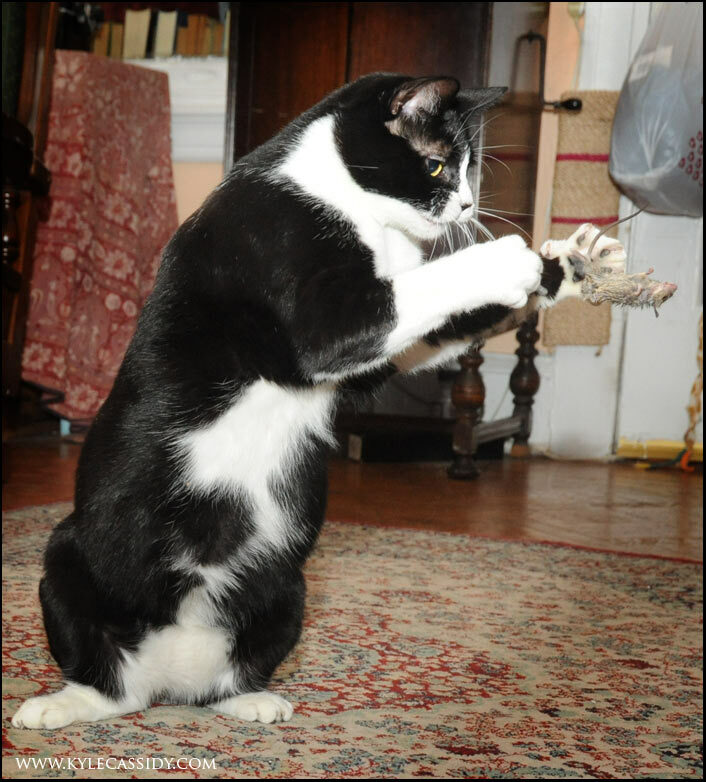 But there you have been with Roswell who against all odds, due to an encounter with enlightened beings (you and trillian) and enlightened host (many social media mongers, LJ back in the day) raised Roswell to a pinnacle above which no cat could hope to aspire. I've tried to take inspiration from this to better understand and care for the cat that my son abandoned in my apartment. While I've fallen far short of what you and Roswell have accomplished (in the day to day matters, no consideration towards the celebrity status Roswell has achieved) I do think there has been more care and tolerance engendered due to your and Roswell's example. Roswell goes forward having had a good life. I remember reading her story as it unfolded, it's a great story! Her story and the stories of some others I read on LJ back then showed me there was a world of loving cats beyond having one or two as pets, and had no small part in me now fostering and volunteering for a local rescue where I live. Enjoy every day, none of us know how many we have left! What a beautiful story! It reminds me of my cat Gam. I can tell that there is a lot of mutual love between you and Roswell. Blessed be your heart and hers. Bright Blessings to Roswell for all the days left in her last party. I hope you all have a splendid celebration of her remarkable life. I'm so glad the Very Best Cat and the Very Best Humans found each other! And I've loved reading everything you've shared about Roswell over the years. She truly is a wonderful cat. Love, seaweed and belly rubs to all! I remember the story as it unfolded here on LJ -- it was my introduction to you, sir, as well. 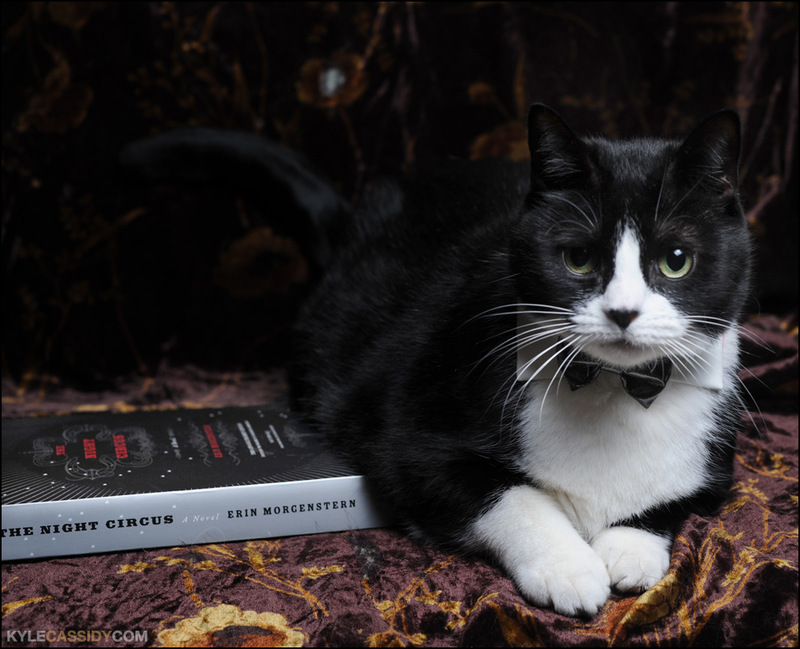 In my writing room I have a photo of Roswell in a bow tie that you sent to me as a thank you for putting together a series of art projects with your LJ fanbase. I still smile every time I see it. May all her days with you and Trillian be as great as they have been. Sending all the love of furry companions ever. I am in tears. I wish I could get out there and pet that belly. 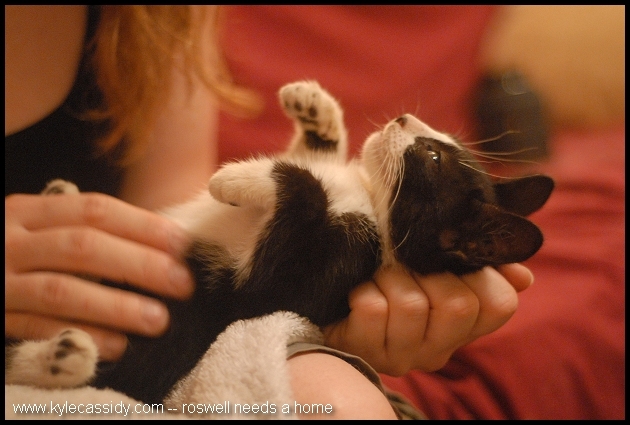 Roswell has been an absolute inspiration and joy. Genevieve will be waiting on the other side of the Rainbow bridge. Much love and many nori hugs. Don't cry! this is a happy thing. It's just infinite food and belly rubs from now on. We can skype her in if you want to see her and say hello! And thank you for making her steampunk famous!!!! I've followed Roswell's story from the beginning also and I know I shouldn't be sad, but I am anyway. She's had a wonderful life with your guys - she's famous, she haz love and nori! and she's not worried about the future. Whatever it holds for her, she know you guys will take care of her. But I'm still sitting here with tears dripping down my face. I wish I could come to her party, but I will be there in spirit at least. My dear Shadow Man will be waiting to greet her when she crosses Rainbow bridge. And yes, I cried about the spider too. awww that is sad, wish I was close enough to come to the party. 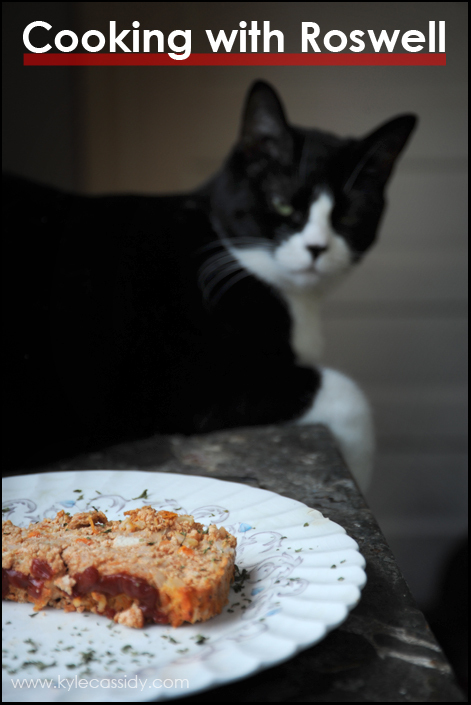 My West Philly cat Durkheim that I rescued the year before (2005) is still around but blind in one eye and a lot skinnier than he used to be. Has it really been 12 years? I will always have that picture of you holding her ingrained in my head. That's when i knew she wasn't going anywhere. 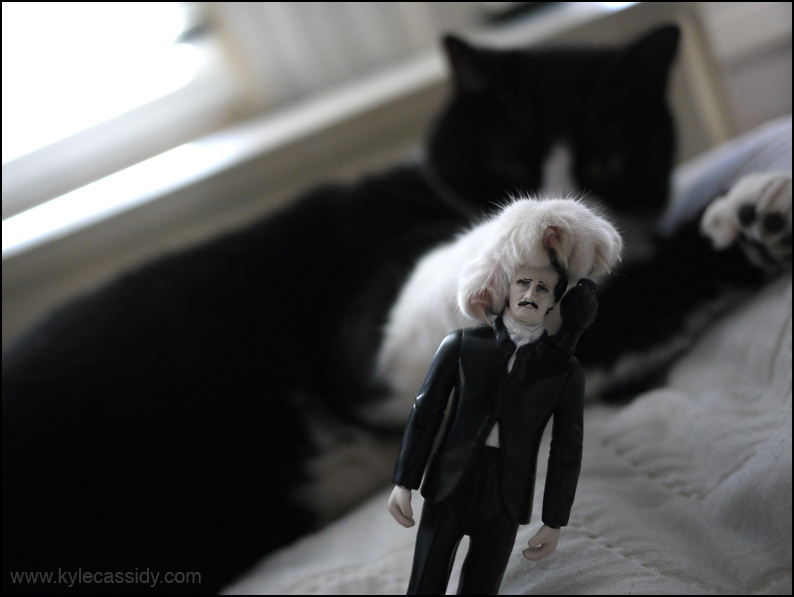 I think of Roswell and MorningCatFace whenever my own cat wakes me up insistently demanding breakfast. My favorite Roswell memory is that time someone sent a pound of seaweed to her and she was so delighted eating a big piece. 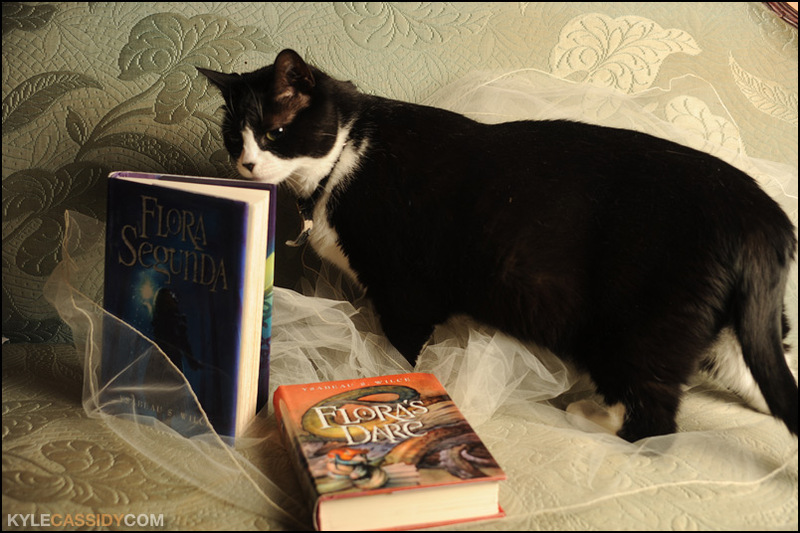 I am so glad Roswell made it into so many stories and pictures so that people who never got to pet her in person will get to know her. Please carry Roswell around for me. She is the best. So glad Roswell was able to find such a good home with wonderful people. Thank you for sharing such a great cat with us. Much love.